A night at the dogs or greyhound racing is much more than watching dogs chasing a rabbit around a track. It truly is a fantastic night out for any kind of party, plus the thrill of having a flutter on your favorite dogs. A night at the dogs or greyhound racing is much more than watching dogs chasing a rabbit around a track. It truly is a fantastic night out for any kind of party. As well as the thrill of having a flutter on your favorite dogs, the grandstands also have a range of restaurants and bars, plus the option to take a suite for a private party. 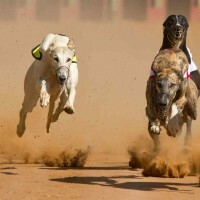 Perfect for any kind of party including Stag dos and Hen weekends, birthday bashes, anniversary parties, boys or girls nights out or leaving do?s, a night at the dogs is a fun and exciting activity for everyone.